I can’t say for certain, but there’s a pretty good chance that the New York Rangers’ John Mitchell was haunted by some fever dreams last night: Think something along the lines of Elephants on Parade, except with the Cheshire grin of Marc-Andre Fleury in place of all the Dumbo heads. 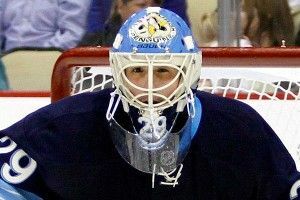 Fleury was in net Thursday night as the Penguins came to Madison Square Garden to take on the Rangers, who held a six-point lead over Pittsburgh in the Atlantic Division (and the Eastern Conference). By the end of the night, though, that gap had narrowed to four, as the Penguins defeated New York 5-2 based in large part on the play in net by the goaltender colloquially known to teammates as Flower. He stopped 29 of the Rangers’ shots, five of which belonged to poor Mitchell, who was robbed every which way by the 27-year-old netminder. After one sequence in which Fleury, already down on his side after making some pad saves, managed to glove an attempt by Mitchell, the Rangers forward couldn’t help but take out his mouth guard so he could laugh. Good goalies create their own luck, which is why it wasn’t surprising to see a friendly crossbar or two give Fleury a little bit of help. (As he often does, he gave the pipe a little bit of a back rub in thanks.) He picked up the win against the Rangers, his eighth straight. His record on the season is now 38-14-3; only Nashville’s Pekka Rinne has more wins, with 39. Over that span he’s allowed more than two goals only once, and he’s allowed only one goal four times. (He also picked up one shutout, in another game against the Rangers on February 21.) Like the rest of his team, Fleury appears to be peaking at the right time — a few weeks before the postseason, with Sidney Crosby and Kris Letang back in the lineup. I don’t speak French, but I did catch the words “tres bien” in this postgame interview, and I must say in agreement: oui oui. Ilya Bryzgalov, who was named the NHL’s first star of the week Monday for his performance last week, continued his season turnaround even after earning the accolades. On Thursday night, he broke the Flyers’ franchise record for the longest shutout streak, previously held by John Vanbiesbrouck, when he went 249 minutes and 43 seconds without allowing the puck to pass by. (He then let in two goals in the span of 35 seconds, but that’s neither here nor there.) Bryzgalov has now won seven straight starts, four of which have been shutouts, and has a downright gaudy .966 save percentage in March. Thankfully for Philadelphia’s fans (but unfortunately for its beat writers), he’s done so without the tabloid-ready antics and potent quotables that were so frequently on display earlier this season. After a 3-0 shutout of New Jersey on Tuesday, the Philadelphia Inquirer‘s Marcus Hayes wrote that when writers informed Bryz that he was just 31:28 shy of eclipsing Vanbiesbrouck’s mark, the goaltender didn’t respond with his usual bon mots: “‘Thanks for letting me know,’ Bryzgalov said, coldly.” Brrrrr! Love this investigative post at The Goalie Guild about the mystery behind Tampa Bay’s Dustin Tokarski’s pads, and love even more that Roberto Luongo is somehow involved. A couple of goaltending duels took place Thursday night, both of which ended in shootouts. Nashville’s Pekka Rinne, who has been on a tear lately, and San Jose’s Antti Niemi, who has not, stopped 34 and 32 shots, respectively, as the Sharks edged the Predators 2-1 in the skills competition. The Devils’ Martin Brodeur and Colorado’s Jean-Sebastien Giguere, meanwhile, held both opposing teams scoreless throughout regulation and overtime, forcing a shootout that New Jersey took for the 1-0 victory. that gives a coach a heart attack.” Expect more heart attacks should the Stars make the playoffs — Lehtonen has appeared in just two playoff games in his career. Stick taps to Carolina’s Cam Ward, who earned his 200th career win Thursday night as the Carolina Hurricanes defeated the St. Louis Blues 2-0.